Non-surgical hair replacement is the art of providing our clients, both male and female, with a natural looking head of hair that looks and feels like their own growing hair. By age 30, 95% of men will experience signs of common male-pattern baldness. By age 50, 85% of men will have significantly thinning hair. Women often experience hair loss caused by factors such as, hormonal imbalances during pregnancy and menopause, high androgen-level birth control pills, illness or surgery, stress and heredity. Before considering any hair replacement option consult a physician to discuss why you are experiencing excessive or abnormal hair loss. Salon Rispoli encourages you to contact the AMERICAN HAIR LOSS ASSOCIATION for objective informed answers to your hair-loss questions. What makes our non-surgical hair replacement service the best? Our founder, Mario Rispoli has over 8 years in the non-surgical hair replacement field and more than 27 years of experience in the art of hairdressing. 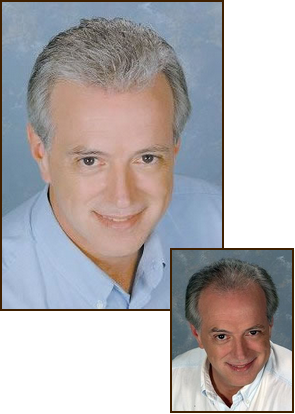 Mario’s many years as master stylist and educator give him an artistic advantage that sets Salon Rispoli apart. In addition Salon Rispoli espouses the philosophy that our clients should be independent. We believe our clients should know how to style and maintain their hair replacement system with the same expertise as our stylists. Salon Rispoli offers only the highest quality hair replacement systems constructed from both human and synthetic hair. Whether working with a stock unit or a 100% custom made base, any challenge can be overcome to meet your needs. Whether they are called hair systems, toupees, wigs, or strand – by – strand insertion systems, all hair prostheses are constructed in a similar fashion using similar materials. All hair systems are machine sewn, hand tied, or use a combination of both methods. Salon Rispoli hair replacement specialists are always up to date on the latest in hair replacement technology. Lesser quality hairpieces are made from low quality human hair, animal hair, low grade artificial fibers or a combination of all three. These hairpieces often “fuzz” quickly and need to be replaced more frequently. Higher quality hairpieces are made of Remi Hair (hair that still has a cuticle layer) or heat resistant artificial fibers. Remy Hair is the highest grade of human hair because it has been processed the least amount. The origin of the hair can be Chinese, Mongolian, Indian or European depending upon the desired finish. It is the preferred choice for hair extensions, hairpieces, and wigs because it achieves the most natural look. With Remy Hair the cuticle layer is kept intact and not stripped. Preserving the cuticle and aligning the hair in a unidirectional fashion creates a hairpiece that is completely natural in appearance. Artificial fibers range from fibers used in costume wigs to very high quality heat resistant fibers, depending upon the manufacturer, artificial fibers can look, feel and perform very much like human hair. Attachment methods range from tapes, adhesives, braiding and sewing, shaving and/or utilizing a skin safe adhesive to simple wig clips. Salon Rispoli believes in preserving the integrity of the client’s hair. Our specialized techniques are sure to achieve the results our client’s desire while keeping their health and well-being in mind. All consultations are complimentary and take place in our private rooms. Your hair system can be either semi-custom or 100% custom designed and ordered for you. Our technicians will match your color, density, wave pattern, and style precisely. Just like real hair your hairpiece will need attention and regular maintenance if you want it to always look its best. When considering purchasing a semi-permanent attached hairpiece plan on purchasing a second unit. This will allow your personal consultant to refresh one hairpiece while you wear the other. Salon Rispoli offers a wide range of packages from single units to programs designed to keep you looking great on a monthly basis. 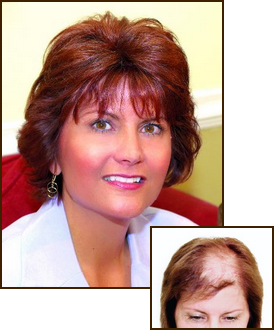 We believe that it is possible to wear an undetectable hair replacement system. We custom fit, cut, and color each system to ensure that your hair looks flawless.